Meet our host for SATURN WEEK: Dr Sarah Hörst (@PlanetDr). Dr. Hörst is an Assistant Professor in the Department of Earth and Planetary Sciences at Johns Hopkins University. Her research group is interested in atmospheric chemistry and how atmospheric hazes form planetary atmospheres in planets both inside and outside the Solar System. Sarah earned her BSs in Planetary Sciences and Literature from Caltech and a PhD in Planetary Sciences from the University of Arizona. 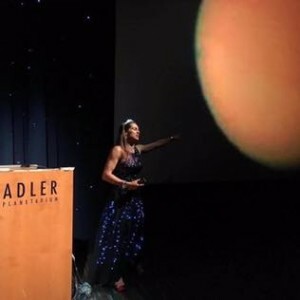 Before arriving at Johns Hopkins, she was a National Science Foundation Astronomy and Astrophysics Postdoctoral Fellow at the Cooperative Institute for Research in Environmental Sciences at the University of Colorado-Boulder. Here’s how Sarah ended up in science and as Titan Saturn Moon’s biggest earthly fan. My mom is a neuroscientist and my dad was a doctor. I was around science formally and informally a lot as a kid. I also grew up in Montana and spend a lot of time outdoors. Science was usually my favorite subject in school so I guess it was kind of a natural path for me. I loved space and especially planets as a younger kid and high school I got interested in chemistry. It wasn’t until I was already at Caltech that I discovered that you could actually be a planetary scientist so I was lucky that I was at one of the best places in the world to study planetary science. As soon as I learned that was an option, I immediately chose planetary science as my major and I never left. I like planetary science because it is so multidisciplinary and you get to solve system level problems. I’m particularly interested in understanding the role that planetary atmospheres play in the habitability of a planet and the role they may play in the origin and/or evolution of life. I’m especially interested in atmospheric chemistry. Because I’m interested in how planet work as a whole, my group has also started working on surface atmosphere interactions. At a fundamental level planetary science is really about understanding how planets work. While not everything we do is directly applicable to improving our understanding of the Earth, the more we learn about planets in general, the better we’ll understand how the Earth works. This is especially true as our climate changes and we are forced to trust model predictions for how it will change in the future. I do a lot of [outreach] work with K12 (primary and secondary) school teachers to help them use planetary science in their classrooms. For most of the United States there isn’t very much planetary science required in the curricula but at the same time kids really like planets so we can use planetary science to teach math, reading, and other required science concepts in a way that really engages students. I used to do triathlons although I don’t have much time for that these days. I really enjoy running and cycling plus working in my garden and on my house. I also like to do crafty things like knit, quilt, crochet, and make jewelry. I have two dogs, Peanut and Ewok (@booplefloofs). My ideal day off would definitely involve some kind of outdoor exercise (a long run, ride, or hike), curling up with a good book, and then cooking, eating, and laughing with the people that I love. Please welcome Sarah to Real Scientists! Melting Moments with Volcanologist Morgan Haldeman at Real Scientists!